Come out to Game Point for a Draft and a Draft. 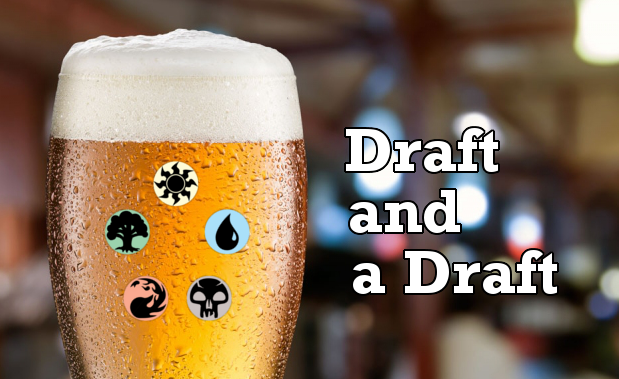 We start off with a Magic the Gathering booster draft, then add on to that a draft beer from one of the many craft beers we have on tap (or a Kombucha or Nitro Coffee or . . . we have options). Top that off with three rounds of Swiss with the deck you drafted, each win getting you a bonus pack. It all adds up to a fun, fun night. $20 (tax incl.) gets you the cards for the draft, any prize packs, and a draft beer. Whether you are currently into Magic, or looking to have some fun with the game that you loved to play back in middle school (high school?) (college?) – come on out for an evening of mana and memories.